The anguish and frustration of having a young child who is frequently sick is something many parents can relate to. Ear infections are not only miserable for the child, but can impact significantly on family dynamics, with interrupted sleep for child and parents alike, and often necessitating parental time off work. Sound waves travel in air. The inner ear is a fluid filled organ that converts waves in fluid into electrical impulses that travel along the hearing nerve to the brain. Connecting the two is the middle ear. The middle ear is designed to translate waves in air into waves in fluid (acoustic coupling), and also acts as an amplifier to allow detection of lower intensity sounds. 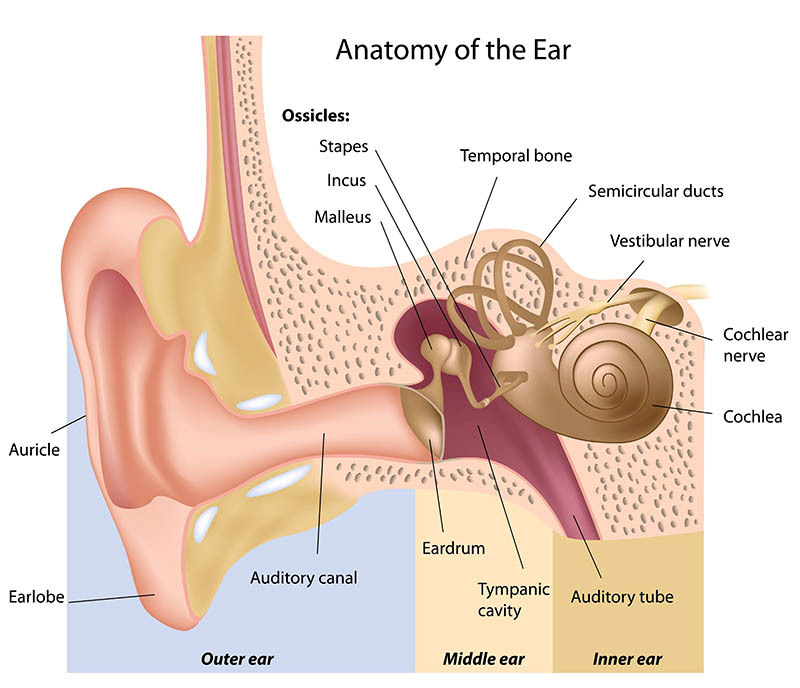 It is normally filled with air, and contains three bones (ossicles) that connect the ear drum to the inner ear. It is part of the upper respiratory tract, and is continuous with the back of the nose (nasopharynx) via the Eustachian tube. The Eustachian tube is normally closed, but opens when we swallow or yawn due to actions of muscles in the throat that pull on it. This equalises pressure in the middle ear with atmospheric pressure, allowing the ear drum (tympanic membrane) to vibrate easily. It also assists with drainage of secretions into the nose and throat. When the Eustachian tube fails to function correctly, air inside the middle ear gets reabsorbed, and secretions (mucus) and associated bacteria build up, leading to mild hearing loss, discomfort, and risk of recurrent acute infection. Middle ear infections are caused by viruses and bacteria, often ascending from the nasal cavity. They present with fever, lethargy, ear pain, loss of appetite, hearing loss, and sometimes imbalance. Complications include rupture of the ear drum with discharge of pus, and infection of the mastoid sinus (mastoiditis), an air “reservoir” behind the ear that is an extension of the middle ear. Are antibiotics necessary to treat an acute infection? Many infections are due to viruses, and antibiotics are not indicated. For bacterial infections, although serious complications are rare, the highest risk age group is below two years of age so treatment in this age group is sensible. Beyond this age, antibiotics will reduce the duration of symptoms by 24-48 hours, so may be helpful. However, most bacterial infections will be self limiting, so it could be argued to treat with just analgesics or anti-inflammatory medications. If the ear starts discharging, the infection has drained itself, and the ear drum will usually heal fairly quickly. In some cases, the addition of topical antibiotic drops may be appropriate. Young age, due to anatomical differences in the position and size of the Eustachian tube: children under five years of age are at highest risk. The peak incidence for glue ear is 2 years of age, with a second smaller peak at school entry. The commonest consequence of middle ear fluid is hearing loss which is usually mild to moderate. Additionally, children with glue ear may be troubled by intermittent ear ache, interrupted sleep, irritability, and problems with balance. 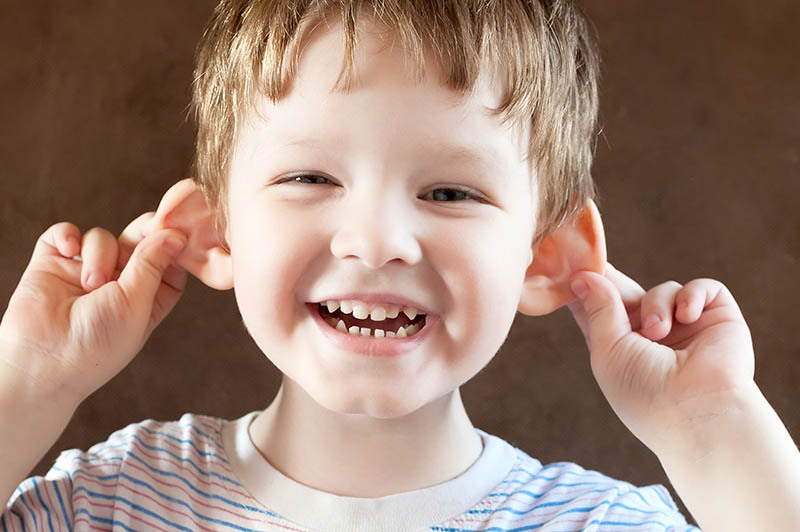 Persistent glue ear with a hearing loss may lead to speech and language delay. Most glue ear (more than two thirds) will resolve over 3 months, so in the absence of other concerns such as speech delay, initial management is often just observation. Treatment is generally recommended for glue ear that persists more than 3 months, and is associated with a hearing loss or other symptoms that are impacting on quality of life. Other factors such as presence of a cleft palate, season, and frequency of acute infections may alter the treatment approach. Medications have not been proven to be of benefit in resolution of glue ear and are limited in terms of effectiveness of symptom relief. This includes antibiotics, decongestants, antihistamines, and nasal steroid sprays. Autoinflation, where the child blows up a specially designed balloon using their nose (eg. Otovent) has some evidence to support efficacy, but can be technically challenging for younger children. Hearing aids are an option when the child is unable to have surgery or if parents are unwilling for surgery to be carried out. They may also be the most appropriate management in certain situations such as Down syndrome. Placement of middle ear ventilation tubes (grommets) is a relatively simple procedure to treat chronic glue ear. Small plastic tubes with approximately a 1 mm hole through the middle are placed in the ear drum via a small incision. The tube allows for drainage of fluid and ventilation of the middle ear, to equalise pressure and prevent bacterial overgrowth. Placement of grommets reduces the frequency of acute infection by about 80%, and corrects the hearing loss associated with glue ear. Grommets are naturally shed from the ear drum over about 9-12 months, and about one third of children will need them replaced at this time. The likelihood of requiring more than one set of grommets is increased if the first set is needed at a young age (< 2 years), and if the child attends child care. Adenoidectomy is sometimes advocated as an adjunctive (and occasionally as an alternative) procedure to grommets. Adenoids can become chronically inflamed and be a reservoir of bacteria, causing protracted inflammation of the Eustachian tubes. Removal of the adenoids is a relatively straightforward procedure that can help address this problem. Both procedures are usually performed as day procedures. Dr Schembri undertook post graduate fellowship training in paediatric ENT, with a special interest in the paediatric airway. He has a large paediatric ENT practice, and is a visiting specialist at the Women’s and Children’s Hospital, North Adelaide, where he established the complex airway clinic. He is a member of the renowned Australian Craniofacial Unit, and has active research interests in paediatric ENT.